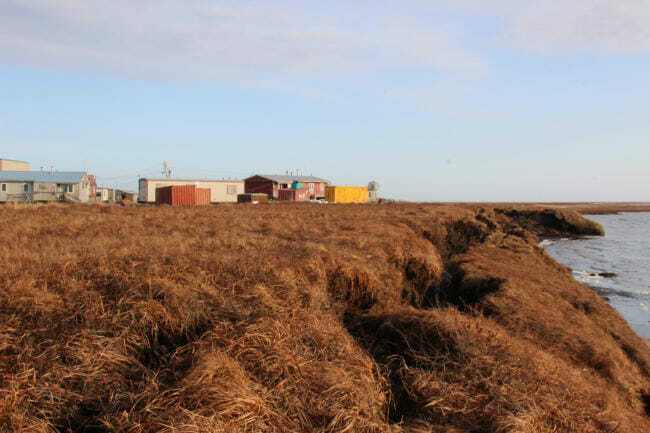 The village of Newtok is disappearing as it loses land to a combination of thawing permafrost and coastal erosion. 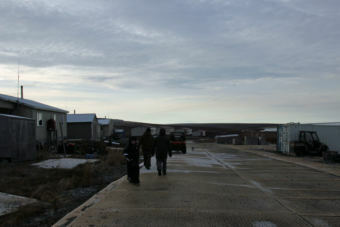 Newtok’s 400 people have been trying to relocate for years, and for years the main obstacle has been the same: money. Now, they’re almost out of time. And residents and officials say, at this point, moving Newtok may take an act of Congress. People say Newtok is dealing with “erosion.” But walk along the bank of the Ninglick River, and you realize that word doesn’t do it justice. “Erosion” sounds like something slow and steady, wearing away at the land. What’s happening here is crazier. Andrew John is Newtok’s tribal administrator. First thing this morning, he says he came out here to the river with his measuring tape. That’s because the land here is breaking off in giant chunks. 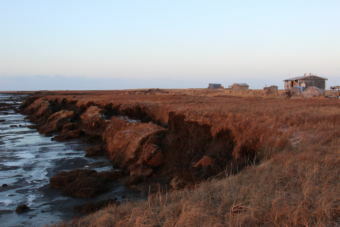 The river is eating away at the permafrost beneath the tundra, undercutting the bank. During a big storm, whole blocks will break off, and the village can lose 10 or 20 feet at a time. The nearest house is about 40 feet from where we’re standing right now. That means people are living just one or two big storms from the edge. And that’s why pretty much everyone in Newtok agrees: it’s time to go. The village wants to relocate to a new site. It’s a 20-minute boat ride upriver — or, on this frigid November day, a very bumpy half-hour ride into a brutal wind. That doesn’t bother John. Heaven is Mertarvik — the new Newtok. It sits across the Ninglick River, on Nelson Island, up on the side of a low mountain. In other words, it’s not about to erode away. Newtok got this land in an exchange with the federal government in 2003. Since then, they’ve been trying to piece together enough funding to build homes and infrastructure. And over the years, they have managed to get some things built. As we approach the new site we see what looks like a proto-village. From the water you can see a handful of houses along a makeshift road. There’s the foundation built for the Mertarvik Evacuation Center, which will someday, maybe, be the school. There’s a row of heavy equipment waiting for the next construction season. As we walk up the hill, John lays out Newtok’s plans for this site: Roughly a hundred homes, gravel roads instead of the sinking boardwalks at the current location and running water, which the current village doesn’t have. That will be a luxury, John says. 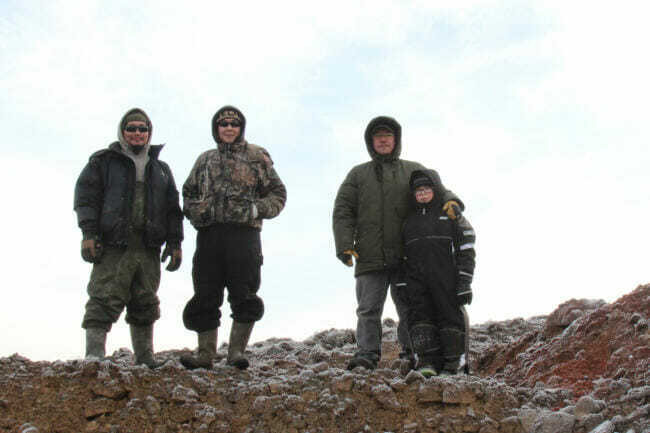 But to see the site’s real point of pride, we load into a four-wheeler and head out to the rock quarry. It was just finished this summer. John can hardly restrain himself as we pull up. He stands up in the back of the four-wheeler to get a better view. It’s just a pit, gouged out of the hillside. But this is the whole reason for moving to Mertarvik: it’s built on rock, not spongy tundra. The river won’t destroy it. And this quarry can provide the gravel for construction. From here, you can see for miles. John explained why this view matters. 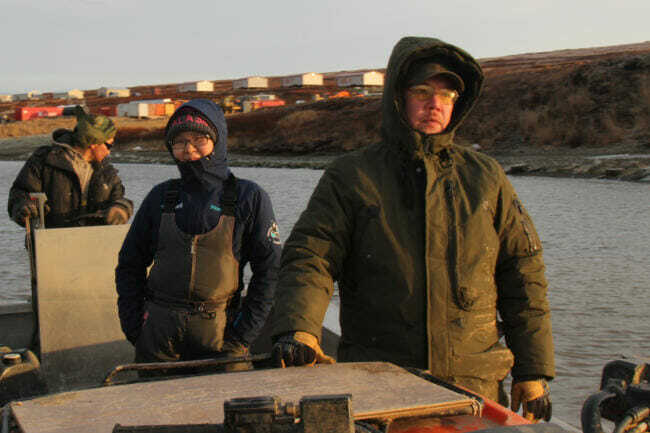 Newtok is a pretty traditional Yup’ik village — one that relies on hunting and fishing. If the village can relocate to this site, close enough to the old one, they can continue that way of life. The problem is, it’s not clear this new village will be ready before the old village is destroyed. And that’s just a few years away. Romy Cadiente is Newtok’s relocation coordinator. “We don’t have time,” Cadiente said. The construction at the new site has been pieced together bit by bit over the last decade. But Newtok doesn’t have anywhere near enough money to build everything they need: housing, an airstrip, a school, a power plant. The U.S. Army Corps of Engineers has estimated that price tag at $130 million dollars. In a village where more than 40 percent of the community lives below the poverty line, that money will have to come from outside. But state and federal agencies have turned down Newtok’s requests for disaster relief and other grants. If it’s not possible to relocate together, families could simply scatter, to Bethel or Anchorage. Cadiente says that’s unacceptable. Joel Neimeyer heads the Denali Commission, the federal agency most closely involved in Newtok’s relocation efforts. He says this problem is bigger than Newtok. Neimeyer says Congress never envisioned relocating whole communities. There’s no agency in charge of it. There’s no pot of money to fund it. And yet, as climate change hits coastal communities around the country with flooding and erosion, it’s a problem we will likely see more and more. Neimeyer believes Congress needs to make a decision: In these situations, is it U.S. policy to move whole communities? Or just move families? Or do nothing? Returning from Mertarvik, the boat pulls up to Newtok’s deteriorating shoreline. From the water, the scene takes your breath away. It’s dusk, and lights are coming on in the houses near the shore. Just steps from those homes, the land is literally crumbling away, the black earth sloughing off into the water. The waves roll over three old snowmachines and the remains of a road, casualties of this fall’s storms. By this time next year, the water will reach those homes. Andrew John says he doesn’t understand why this isn’t enough to deserve help. It’s a fight that may ultimately be won or lost nearly 4,000 miles from here, in the halls of Congress. This story is the second of two parts. The first part looks at what what would be lost if Newtok disappears.